Mary sent me a link to an abstract about "a compression syndrome of the deep terminal (motor) branch of the ulnar nerve in biking." 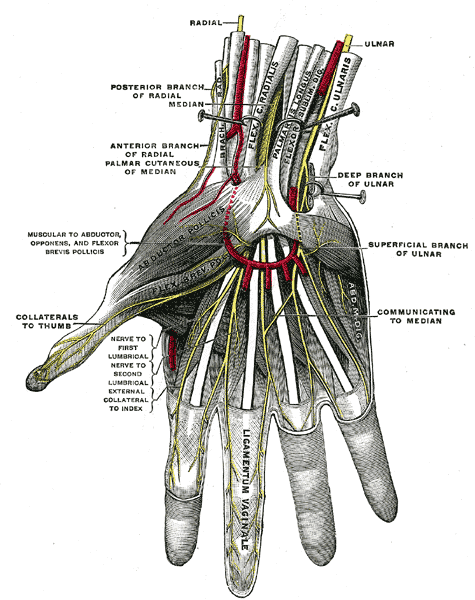 Here's an anatomical illustration from Gray's to show just where the deep terminal branch of the nerve is. on almost any ride i need to guard against my hands falling asleep. obviously i'm leaning on them too much. Oh, man! Aidan's hands often fall asleep when he is riding his bicycle around the lake while we are out for our runs. Does this mean he is leaning too much on them?